Manufactured from a far superior aluminium than most high performance pistons, it contains a much higher silicon content. Using advanced heat treatments, a more heat-stable piston is created. This dramatically reduces expansion under combustion/running conditions. Consequently lower piston to bore clearances are required, maximising piston stability in the bore, and therefore better piston ring sealing. These pistons are manufactured for race use so are more than adequate for any application, allowing up to 13.5:1 CR to be used (with suitably altered distributor advance curve). 10Cc dish. 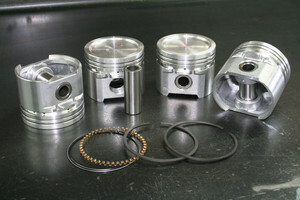 Sets come complete with piston rings and standard 0.812" diameter wrist pins. Pin to crown height is 1.5276" as per A+ high compression pistons. Total Seal Gapless top ring piston ring sets available for these pistons separately - part number CST3031-73.0." All-up weight including rings and pin 369 grams.